“We are honored to convene the lymphoma community and so many wonderful lighting partners in this truly global show of support for the Lymphoma Research Foundation and for all those touched by this disease,” said Meghan Gutierrez, LRF Chief Executive Officer. The Lymphoma Research Foundation (LRF) – the nation’s largest non-profit organization devoted exclusively to funding innovative lymphoma research and serving the lymphoma community through a comprehensive series of education programs, outreach initiatives and patient services – today announced its annual global Light it Red for Lymphoma awareness initiative. Since 2011, the Foundation has been a pioneer in shedding a “light” on lymphoma during September, recognized each year by the United States Congress as national Blood Cancer Awareness Month (BCAM), with Light it Red for Lymphoma by partnering with national and international landmarks, communities, and individuals to raise funds and awareness for the disease. Now in its seventh year, Light it Red for Lymphoma is designed to garner awareness and provide hope to those touched by this disease by encouraging not only buildings, landmarks and businesses to light red, but also individuals to wear red and support BCAM on social media throughout the month of September. In direct partnership with the Lymphoma Research Foundation, more than 100 national and international buildings and landmarks will participate in this year’s Light it Red for Lymphoma initiative, including international partners Taipei 101 in Taipei, Taiwan; Bell Tower in Perth, Australia; CN Tower in Ontario, Canada; National Concert Hall in Dublin, Ireland; national partners One World Trade in New York, N.Y.; Los Angeles International Airport (LAX) in Los Angeles, Calif.; Willis Tower in Chicago, Ill.; TD Center in Boston, Mass. ; and many more. For a full list of committed Lighting Partners, please visit lymphoma.org/LightingPartners. In addition to the Light it Red for Lymphoma initiative, the Lymphoma Research Foundation will further seek to raise funds and awareness during Blood Cancer Awareness Month, by encouraging members of the lymphoma community to donate $15, or a multiple thereof, in recognition of World Lymphoma Awareness Day (WLAD) on Sept. 15. Supporters will be motivated to make a donation in honor of a doctor or member of their healthcare team who helped make an impact on their life. 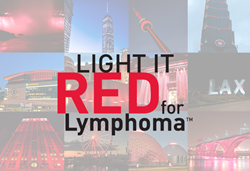 To donate to the Foundation’s Light It Red initiative, please visit support.lymphoma.org/2018BCAM.